In recent years, the Mexican drug war has consistently made headlines for its appalling levels of violence and ever-increasing death count; with a figure approaching 70,000 people killed since 2006. Previously, violence in Mexico had largely been associated with drug trafficking and was concentrated in a handful of regions along key smuggling routes, especially near the U.S. border. However, under the Felipe Calderon administration (2006-2012), Mexico's drug cartels faced rising pressure from state security forces, resulting in their fragmentation and the dispersal of criminal violence around the country. Drug cartels responded to enhanced counter-narcotics operations by expanding their criminal portfolios into locally focused crime in order to supplement their earnings. This has led to a sharp increase in cases of extortion and kidnapping (979 and 3,634 cases, respectively, were reported through the first six months of 2014), wreaking havoc on Mexican society. A side effect of this violence that has received relatively little attention is the impact on the mental health of victims and the community at-large. More specifically, violence accompanying the Mexican drug war has contributed to a pervasive sense of fear and insecurity, creating conditions that have put millions of Mexican citizens at risk for developing post-traumatic stress disorder (PTSD). PTSD is most commonly associated with soldiers returning from war, and has attracted widespread attention in the United States for its effects on veterans of the Iraq and Afghanistan wars. Yet, while Mexico is not at war in the traditional sense, many Mexican communities live in a state of siege—either actual or perceived. While some areas are affected more than others, the majority of Mexican communities have been exposed—directly or indirectly—to various degrees of traumatic violence. Nevertheless, the Mexican state has not devoted adequate attention to those victimized by violence. This role has largely been taken up by a number of civil society organizations, such as Ciudadanos en Apoyo a Los Derechos Humanos (CADHAC) in Nuevo Leon and the Movimiento por la Paz con Justicia y Dignidad (Movement for Peace with Justice and Dignity). In conjunction with the important role of these organizations, however, it is imperative that the Mexican government and health system acknowledge and research the problem of PTSD in victimized populations. The short- and long-term effects of high levels of violence on the mental health and fabric of Mexican society could potentially be grave. For the sake of Mexico's future generations, it is therefore crucial that the Mexican state begin allocating sufficient resources towards supporting those victimized by violence in order to mitigate the growth of PTSD's nefarious consequences. Felipe Calderonis widely regarded as one of the catalysts for Mexico's current wave of violence. Upon taking theoffice of the presidency in 2006, Calderon declared a war against Mexico's drug cartels. This consisted of an aggressive strategy of confrontation and, with the deployment of the armed forces into Mexico's streets and communities, the increasing militarization of policing functions. Drug cartels, now finding themselves the target of antagonistic governmental policies, escalated the brutality of their tactics. This was done in order both to defend themselves against incursions by state security forces and to exploit any openings created to win territory from rivals. Violence quickly spiraled out of control, and has been extraordinary in its severity and indiscriminate targeting. Mass killings, torture, dismemberment, disappeared persons, extortion, and kidnapping have become all too commonplace, leaving a wake of destruction rippling through Mexican society as hundreds of thousands suffered. 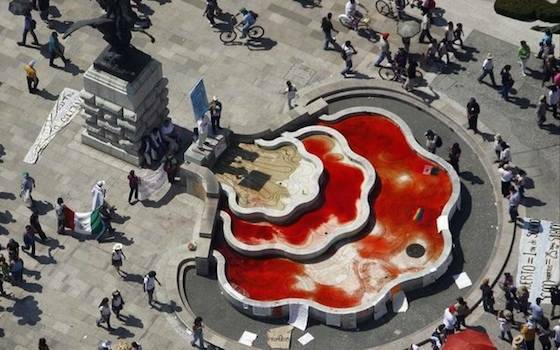 The scale of violence in Mexico is difficult to grasp. During the six years of Calderon's term (2006-2012), more than 50,000 people were killed (a total of over 70,000 have reportedly died through 2014), 250,000 were displaced from their homes, 10,000 disappeared, and 8,000 wereorphaned. By 2010, the homicide rate was double that of 2006. Fortunately, homicide figures for 2012 and 2013 have shown a slight declining trend. However, extortion and kidnapping levels have increased at an alarming rate. According to official statistics from Mexico's Interior Ministry (SEGOB), there were 8,199 reported incidences of extortion in 2013, higher than any other year in the past decade. There has also been a steady rise in documented cases of kidnapping, climbing from 438 in 2007 to 1,698 in 2013. Nonetheless, it is estimated that the vast majority of kidnappings and extortions have gone unreported. Victims are often reluctant to seek help from officials for fear of retribution by criminal groups or that the police are corrupt and in cahoots with the criminals. Overall, after nearly eight years of elevated levels of criminal violence, hundreds of thousands of people have been directly or indirectly victimized. Many Mexican citizens rightfully perceive the government as inept and unable to provide adequate security and justice. This has contributed to the creation of a far-reaching climate of insecurity, fear, and helplessness. High rates of exposure to traumatic experiences among Mexico's populace, along with extensive and often graphic media coverage, have produced degrees of trauma similar to those usually characterized with war zones. Consequently, many experts now say mental health conditions typically associated with war veterans, such as PTSD, are on the rise in Mexico. According to the Mayo Clinic, the most common events driving PTSD's development include combat exposure, childhood neglect and physical abuse, sexual assault, physical attack, and being threatened with a weapon. Other events that may also bring about PTSD are, among others, natural disasters, robbery, torture, and kidnapping. The Mayo Clinic also reports that those who do suffer from PTSD have demonstrated difficulties in maintaining their job, relationships, health, and quality of life. In addition, PTSD has been found to increase the risk of developing other mental health problems, such as depression and anxiety, as well as substance abuse or suicidal thoughts and actions. While PTSD can cause numerous symptoms, the NIMH classifies them into three broad categories: re-experiencing symptoms, avoidance symptoms, and hyperarousal symptoms. Bad dreams or flashbacks are examples of re-experiencing symptoms. Avoidance symptoms may include feelings of strong guilt or depression, loss of interest in activities one enjoyed in the past, and staying away from places or objects that are reminders of the traumatic experience. Hyperarousal symptoms may consist of being easily startled, feeling tense or “on edge,” having difficulty sleeping, and angry outbursts. To be diagnosed with PTSD, a person must exhibit at least one re-experiencing symptom, at least three avoidance symptoms, and at least two hyperarousal symptoms for at least one month. Several existing studies on the mental health of civilian populations living in violent communities in U.S. cities offer a source for drawing comparisons with the case of Mexico. Despite cross-cultural differences, the studies demonstrate that PTSD can indeed have a wide presence in civilian populations affected by disconcerting levels of violence; a concerning find for Mexican society given the wide percentage of Mexico's population that has been exposed to traumatic experiences. The two studies' conclusions suggest that traumatic violence has influenced entire communities in these areas. This cumulative social stress can undermine the fundamental institutions of family, work, and education, both at an individual and a collective level. At a broad level, these Atlanta and Chicago communities have much in common with their Mexican counterparts: they are extremely poor, are plagued by inequality and violent crime, and have limited access to hospitals or mental health services. Given comparable violence-levels and circumstances to these U.S. inner city communities, it is likely that many Mexican communities exhibit similar patterns of PTSD rates among residents. Indeed, many experts now say PTSD is on the rise in Mexico due to the extreme violence seen over the past decade. The border city of Ciudad Juarez, the epicenter of Mexico's drug war from 2007-2012, has been particularly impacted. In 2010, homicide levels in the city peaked at roughly 60 murders per week. In fact, in 2010 more than half of all executions, shootings, disappearances, and kidnappings that occurred in Mexico were concentrated in Ciudad Juarez. Consequently, according to figures cited in a 2013 study by researchers from the National Autonomous University of Mexico, the Ciudad Juarez Municipality has estimated that 14-30 percent of the city's more than 1.3 million residents suffer from PTSD due to both direct and indirect exposure to violent acts. A study conducted by Meschoulam, Estudio sobre efectos psicosociales por violencia en México (Study on Psychosocial Effects of Violence in Mexico), provides some indicators of the violence's detrimental repercussions on citizens' mental health. The research was based on a sample of 333 people from 15 of Mexico's 32 states, who were given a questionnaire. The results discovered that 51 percent of the interviewees said violence affected their work life, 72 percent their social life, and 58 percent their family life. A further 42 percent of the respondents asserted violence had an impact on their economic status, and 60 percent reported that it had influenced their mental health. Half of the respondents perceived the media to be the principal transmission channel of stress. Furthermore, 10 percent changed their residence out of fear, 80 percent had stopped frequenting places out of fear, and 54 percent had altered their daily routine. The 2012 National Survey on Victimization and Perception of Public Security, administered by the Mexican government's statistics agency INEGI, reported the number of households with at least one adult victim of crime to be 9,261,721—nearly 31 percent of Mexican households. However, most Mexicans are indirect victims of violence; as a result, they cannot be figured into any official government statistics measuring victimization rates. Many people, however, feel that they are more than mere bystanders because they have been forced to change how they live, work, travel, and conduct their social activities. Access to mental health services is limited because of Mexico's centralized health care system, meaning the majority of establishments are located in large cities. An investigation into Mexico's mental health system published in April 2013 found that only 30 percent of primary care services possess protocols for the evaluation and treatment of mental disorders. Additionally, the report discovered Mexico's meager mental health facilities, with the low ratios of 1.6 psychiatrists, 1.3 other physicians, 3.4 nurses, and 1.5 psychologists per 100,000 of the population. Dr. Elena Azaola, a prominent social anthropologist in Mexico City, said that while the government has been trying to implement more programs to prevent crime, there are no programs dedicated to working with these types of PTSD victims. Furthermore, Dr. Azaola mentioned that there is a general lack of awareness on the need to provide mental health services, with extremely low budgets and professional abilities to manage the issue. Support groups—religious, community, or family—have therefore been critical in helping people deal with the negative side effects of exposure to traumatic experiences. A number of civil society organizations also provide vital support and mental health services for victims of traumatic violence. These are largely organized on a local basis, and have sprung up in various localities around Mexico. One of these organizations, Ciudadanos en Apoyo a Los Derechos Humanos (CADHAC), is based in the Mexican state of Nuevo Leon. CADHAC has been working with human rights victims by offering legal services as well as psychosocial support. Starting in 2011, CADHAC began to pay particular attention to psychological support for family members of people who had disappeared as a result of organized crime. Liz Sanchez Reyna and Ana Luna, two employees at CADHAC with experience working with victims, said the violence has been particularly intense since 2009—including executions, disappearances, extortion, arbitrary detentions, and torture. Between the effects documented, CADHAC has observed a general fear in the population, which they assert has resulted in people living in a different manner than pre-2009. Now, people are more reluctant to be on the streets for fear they may be victimized. This fear, Reyna and Luna say, has impacted the community in general, damaging the overall social fabric. In the near-term, the immediate goal for Mexico needs to be the strengthening of police and judicial institutions to betterprotect and provide justice for victims of violent crime. Mexico's powerful criminal organizations must be prevented from waging war against the citizenry with near total impunity. However, the Mexican state and health system, in conjunction with civil society, need to devote adequate resources towards recognizing and treating mental disorders among the population that arise from traumatic experiences and long-term exposure to violence and stress. This calls for a more comprehensive anti-violence strategy; one that will work with local residents to build resilience against violence and raise awareness of its deeper, unseen effects on mental well-being. It is imperative that action be taken now to counteract the consequences stress-related disorders could have on Mexico's populace. After the violence in Mexico has subsided (which it hopefully eventually will), the mental and physical scars will remain. If PTSD continues to receive inadequate treatment, and is allowed to fester among large swaths of Mexican society, its reverberations will be felt for generations, hampering the development of healthy economic, social, and familial relationships. "Informe de Víctimas de Homicidio, Secuestro Y Extorsion." Secretariado Ejecutivo Del Sistema Nacional De Seguridad Pública. Secretaría De Gobernacion, Web. 12 Aug. 2014. .
 Godoy, Emilio. "Mexico's Spiral of Violence Causes Spike in PTSD." Inter Press Service, 7 June 2012. Web. 4 Aug. 2014. Baker, Karl. "Mexico's Rising Threat: Extortion." The Christian Science Monitor. The Christian Science Monitor, 19 Mar. 2014. Web. 12 Aug. 2014. . "Tasas Por Cada 100 Mil Habitantes." Secretariado Ejecutivo Del Sistema Nacional De Seguridad Pública. Secretaría De Gobernacion, Web. 12 Aug. 2014. . "Informe de Víctimas de Homicidio, Secuestro Y Extorsion." “Informe de Víctimas de Homicidio, Secuestro, y Extorsion. "Post-Traumatic Stress Disorder (PTSD)." NIMH RSS. Web. 11 Aug. 2014. <http://www.nimh.nih.gov/health/topics/post-traumatic-stress-disorder-ptsd/index.shtml>. "Post-traumatic Stress Disorder (PTSD)." Diseases and Conditions. Mayo Clinic, Web. 10 Aug. 2014. <http://www.mayoclinic.org/diseases-conditions/post-traumatic-stress-disorder/basics/definition/con-20022540>. Post-Traumatic Stress Disorder (PTSD)." NIMH. http://gradytraumaproject.com/; Beckett, Lois. "The PTSD Crisis That's Being Ignored: Americans Wounded in Their Own Neighborhoods." Pro Publica: Journalism in the Public Interest, 3 Feb. 2014. Web. 12 Aug. 2014. <http://www.propublica.org/article/the-ptsd-crisis-thats-being-ignored-americans-wounded-in-their-own-neighbor>. Wilkinson, Tracy. "In Mexico, Ciudad Juarez Reemerging from Grip of Violence." Los Angeles Times, 4 May 2014. Web. <http%3a%2f%2fwww.latimes.com%2fworld%2fmexico-americas%2fla-fg-mexico-juarez-recovery-20140504-story.html%23page%3d1>. Godoy, "Mexico's Spiral of Violence Causes Spike in PTSD." Villagran, Lauren. "The Victims' Movement in Mexico." Mexico Institute. Wilson Center, Aug. 2013. Web. 12 Aug. 2014. .
 Llana, Sara M. "Mexico Drug War Casualty: Citizenry Suffers Post-traumatic Stress." World | Americas. The Christian Science Monitor, 3 Dec. 2011. Web. 12 Aug. 2014. .
Berenzon Gorn S, Saavedra Solano N, Medina-Mora Icaza ME, Aparicio Basaurí V, Galvan Reyes J.
 Azaola, Elena. Telephone interview. 2 July 2014. Liz Sanchez Reyna and Ana Luna, “Re: Estrés Postraumatico.” Message to the author. 22 July 2014. E-mail.